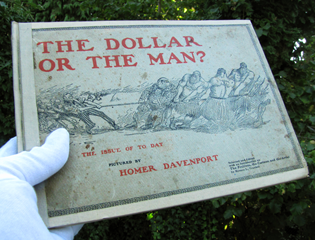 In 1900, Homer Davenport published his second book of political cartoons, The Dollar or the Man? The Issue of To Day. It was another collection of over 50 political cartoons, this time dealing specifically with the influence of monopolistic corporate trusts on society. 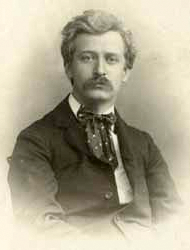 The cartoons were hand-picked by Horace L. Traubel (portrait below), who also wrote the introduction. Traubel (1858-1919) was an American essayist, poet, magazine publisher, and author. He was closely associated with the Arts and Crafts movement in the United States and published a monthly literary magazine called The Conservator from 1890 until the time of his death. Today Traubel is best remembered as the literary executor and biographer of his friend, poet Walt Whitman, about whom he compiled nine volumes entitled Walt Whitman in Camden. Traubel knew Homer Davenport, as well as his father. A letter to T.W. Davenport listed in the Davenport archives at the University of Oregon as “From Unknown,” bares the signature of Traubel. He also wrote a glowing literary review of Homer Davenport’s autobiography, The Country Boy. The cartoons in this volume originally appeared in William Randolph Hearst’s New York Evening Journal, between 1898 and 1899. It was a smaller book that the previous “Cartoons” from 1898, also hardbound, but measuring just eight by eleven inches, with the binding along the short side. These images, of which the famous “Trust Brute” makes his debut, also features the reliable “Dollar Mark” Hanna, and often President McKinley himself. Also present are several featuring Theodore Roosevelt, then a fresh new VEEP, complete with Rough Rider hat. And the usual corporate suspects. Hearst (right, as pictured by Davenport in the preface of DOTM), was thereby accused by rival newspapers—and by then Secretary of War Elihu Root—of having called for McKinley’s assassination. And this probably cut into Davenport’s book sales. 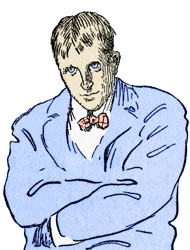 Curiously, Hearst neither revealed Bierce as the author of the poem, nor fired him. The only previously known copy of DOTM rests in the archives of the Silverton Country Historical Society. When this copy was discovered online for sale by a Salem book dealer, it was decided that this was an investment in the future worth making. This entry was posted in Cartoons, History and tagged Davenport, Horace L. Traubel. Bookmark the permalink.